Unusual situation arises during HamKam v Nest-Sotra. 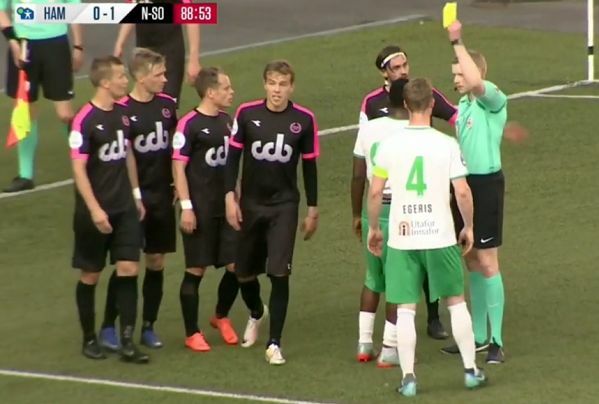 An unusual situation arose in the dying moments of HamKam v Nest-Sotra in Norway’s second tier when the referee gave a penalty AND booked the fouled player for diving. The away side is leading 1-0 when their goalkeeper tries to get away with a light shove on an opponent, who himself takes the opportunity to tumble exaggeratedly to the turf. In what appears to be the referee’s recognition of these dual facts, he both points to the spot and shows the fouled player a yellow card for simulation.